Do you want to use Trakt with Kodi? 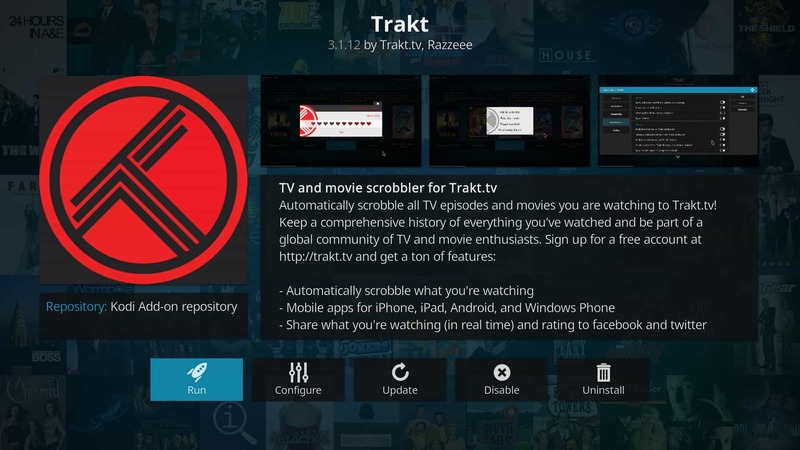 In this article, we’ll be showing you how to use Trakt on Kodi using the Trakt.tv Kodi addon. The Kodi software package is free, open-source, and can be installed on most popular devices including Amazon Fire TV, Amazon Firestick, and Roku. Additional functionality can be added to your Kodi installation using plugins named addons. Trakt is one such addon, but there are thousands available. Trakt is a web-based service that makes it easier to keep track of your media consumption. This guide will show you how to install and configure Kodi’s Trakt addon so any content you access will be noted on your Trakt.tv account. Many people use a virtual private network (VPN) to hide their unlicensed streaming habits from their internet service provider (ISP). That said, there are many ways someone who uses official sources could benefit from using a VPN. An attacker can use a Man-in-the-Middle attack to compromise your system and access private data or files. A VPN prevents this by encrypting your network traffic. This encryption also stops your ISP from selling your browsing habits or throttling your connection based on your activities. Every VPN will slow your network speeds to some degree, but some are better than others. As streaming requires a strong and consistent connection, choosing the right VPN is crucial to a good Kodi experience. It’s not just about streaming, though; some VPN providers keep logs of your activities which reduces your privacy significantly. We recommend IPVanish. It’s a VPN that doesn’t keep any traffic logs and offers fast, stable connections to more than 50 countries. It’s highly portable, with dedicated versions for each major operating system and is the easiest VPN to install on the Amazon Firestick. What is the Trakt Kodi addon? Trakt is a service that integrates with your media center to better keep track of the TV shows and movies that you’ve watched. Whenever you play a file the Trakt addon adds its details (title, date watched, etc.) to your online account. This process is called “scrobbling”. 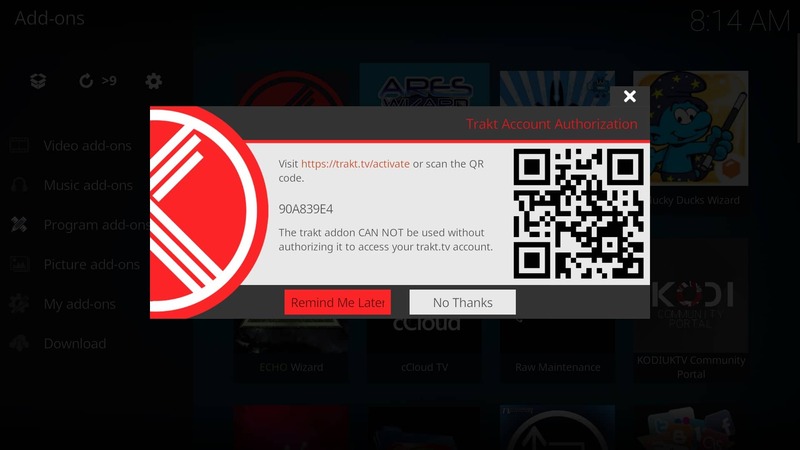 The Trakt Kodi addon extends this functionality to your Kodi installation. Certain addons allow you to integrate your Trakt account and scrobble streamed content, but the majority of these don’t use licensed sources and as a rule, we do not recommend them. Installing the Trakt Kodi addon is very simple. Because it’s located in the official Kodi repository we don’t have to add any sources and can just install it directly. To do this, click on the Add-ons tab on the Kodi home screen. Next, click the box icon in the top left. This will take you to the Add-on Browser screen. Click the Install from repository option and scroll through the list of installed repos until you find the Kodi Add-on repository. From here, find the Trakt addon and click it before selecting Install. If all goes well you’ll see a notification in the top right telling you Trakt was installed properly. First of all, you’ll need a Trakt.tv account. Register for one here. Before the Trakt addon can be used it has to be configured. Begin by right-clicking on the Trakt addon’s icon and choosing Settings. Next, click the how do I authorize the trakt addon to access my trakt.tv account? option. You’ll be presented with a code to enter into the box on the activation page. Once you’ve done this, confirm that Trakt is allowed to access Kodi. Now you can continue adding personal information to your profile if you’d like, but this step is completely optional. Back in the Trakt addon’s settings menu, there are several options that allow you to customize what content is scrobbled. Under the Scrobbling tab, you can select whether you want to only upload movies or TV shows. The Offset scrobble start by X minutes option is particularly useful as it allows you to add content that you’ve watched for a set period of time, instead of adding shows you dropped in the opening minutes. A good time period for this would be ten minutes but you can set it to whatever you like. The Trakt Kodi addon is mostly used for locally stored content so if you don’t have any, you’ll have to add some. It’s important to note that you may have to refresh your library before titles are scrobbled with Trakt. You can do this by restarting Kodi or by right-clicking the source folder and changing the content to “None”, then back to whatever it was before. We tested the Trakt addon with two public domain titles, one locally stored (the 1968 version of Night of the Living Dead) and one legally streamed from a third-party addon (Algiers, 1938). There were no noticeable differences between the way Trakt handled the titles so as long as you use properly licensed sources you’re free to use whichever you prefer. Once in your library, your movie or TV show should show up under the relevant tab on the Kodi home screen. If Trakt is working properly the content should also become visible in your online Trakt collection. Once you’ve finished watching a TV show or movie for the first time, a popup will appear asking you to rate it out of ten. This rating will appear on the title’s artwork in Kodi. Similarly, if you go to your Trakt ratings page, you’ll see that the title you watched and its rating are both shown. The content you watched will also show up in your Trakt watch history. Entries can be deleted by clicking the purple tick icon underneath the entry’s artwork. Trakt uses your likes and dislikes to recommend similar content, so it’s definitely worth getting into the habit of rating media. You can see your total watch time, recently watched movies, and favorite genre from your Trakt profile page. While the Trakt Kodi addon does not provide all of the same functionality that the web-based version does (playback progress, list management), it certainly offers enough flexibility to make managing an extensive media library very simple. We’d have liked to have seen more support for official streaming addons. For instance, streamed content from the iPlayer WWW addon is not scrobbled, whereas titles from several third-party addons like Exodus, are. That said, this requires cooperation from official addon creators, and isn’t due to any fault on Trakt’s part. That said, as Kodi’s own “Mark as watched” functionality is rudimentary at best and doesn’t account for files that were deleted and re-added, the Trakt addon represents one of the best ways to organize and manage media across multiple platforms. Looking for more Kodi addons that might work with Trakt? Check out our guide to the 105 Best Kodi Addons of 2017.